The Dow closed lower on Friday as investors reacted to Donald Trump's plans to impose strict import tariffs on steel and aluminum. For the week the S&P lost 2.04%, the Dow tanked 3.05% and the Nasdaq declined 1.08%. At one point during Friday's session, the Dow was down 391 points. The Dow remains 2,078 points below its all-time high on Jan. 26. Stocks turned mixed on Friday, March 2, as investors reacted to President Donald Trump's plans to impose strict import tariffs on steel and aluminum. The Dow Jones Industrial Average finished down 70 points, or 0.29%. At its session low, the Dow was down 391 points. The S&P 500 was up 0.51% and the Nasdaq gained 1.08% as healthcare stocks rose. For the week the S&P 500 declined 2.04%. The Dow lost 3.05% and the Nasdaq gave up 1.08%. The stocks leading the Dow lower were McDonald's Corp. (MCD - Get Report) and Caterpillar Inc. (CAT - Get Report) . Analysts at RBC cut their price target on McDonald's to $170 from $190 after saying that the fast-food chain's $1 $2 $3 menu was off to a slow start. The Dow finished down 420 points, or 1.68%, on Thursday after Trump said the U.S. would impose tariffs next week on steel and aluminum imports. Trump's aim to curb foreign imports and protect U.S. jobs has investors around the world deeply concerned about a global trade war, with officials in Canada, Germany and China vowing to respond in kind if Trump follows through with a formal announcement next week. On Friday, Trump tweeted: "When a country (USA) is losing many billions of dollars on trade with virtually every country it does business with, trade wars are good, and easy to win. Example, when we are down $100 billion with a certain country and they get cute, don't trade anymore-we win big. It's easy!" Beer makers, car manufacturers and mining companies expressed concern and some outrage Thursday after Donald Trump announced his intention to impose a 25% tariff on steel imports and a 10% tariff on aluminum imports. The move was seen as an effort to protect two struggling U.S. industries that have seen significant drops in employment in recent years and came after Secretary of Commerce Wilbur Ross recommended in mid-February that the administration impose some combination of tariffs and quotas on countries across the globe exporting steel and aluminum to the U.S.
Molson Coors Brewing Co. ( TAP - Get Report) blasted Trump's tariff decision. U.S. Steel Corp ( X - Get Report) declined, but Nucor Corp. ( NUE - Get Report) rose slightly Friday. Both finished the previous trading session with sizable gains. 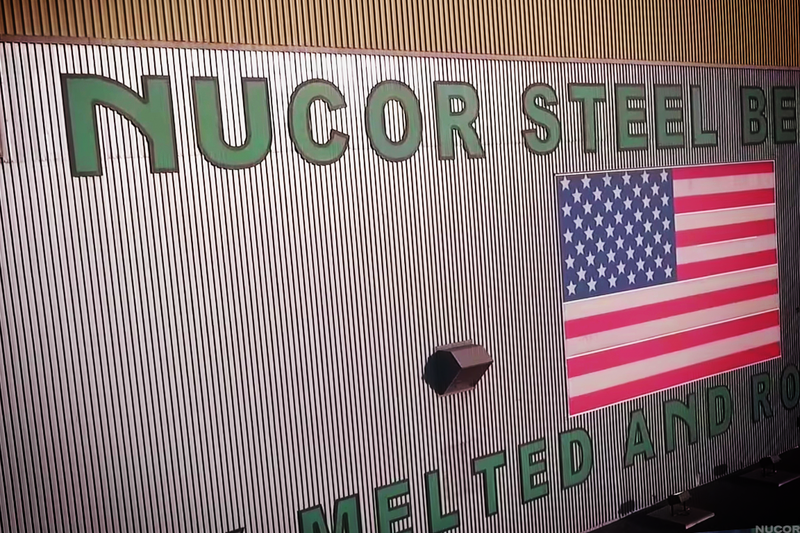 Nucor is a holding in Jim Cramer's Action Alerts PLUS Charitable Trust Portfolio. Want to be alerted before Cramer buys or sells the stock? Learn more now. Markets also were spooked by another round of hawkish testimony from Federal Reserve Chairman Jerome Powell. In his second day of testimony before Congress, Fed Chairman Powell suggested Thursday the central bank could hike interest rates as many as four times this year as the economy continues to improve. Most Fed-watchers have predicted three rate increases in 2018. Foot Locker Inc. ( FL - Get Report) reported fourth-quarter adjusted earnings of $1.26 a share, 1 cent higher than estimates. Revenue of $2.21 billion came in slightly below forecasts, while comparable-store sales in the quarter fell 3.7%, wider than estimates. The stock fell 12%. J.C. Penney Co. ( JCP - Get Report) tumbled 2.4% after fourth-quarter adjusted earnings of 57 cents a share came in higher than estimates but sales missed. Nordstrom Inc. ( JWN - Get Report) rose 5.8% despite the retailer reporting fourth-quarter earnings below Wall Street's expectations. Nordstrom said same-store sales in the quarter rose 2.6%, just days after reports broke that it's about to finalize a bid to go private. Shares of Vista Outdoor Inc. ( VSTO - Get Report) fell 7% after REI, a retailer that sells outdoor apparel and supplies, said it would no longer carry products made by Vista Outdoor because the company also sells guns and ammunition. REI joins a list other companies that have in some way taken a stand against assault-style weapons and the National Rifle Association. Microchip Technology Inc. ( MCHP - Get Report) reached an agreement to buy fellow chipmaker Microsemi Corp. ( MSCC for $68.78 a share, or a total equity value of $8.35 billion. Shares of Microsemi rose 4.6% on Friday; Microchip gained 2.5%. Equifax Inc. ( EFX - Get Report) said an additional 2.4 million Americans were impacted by the data breach last year but the newly disclosed consumers had significantly less personal information stolen.